Multi-media collective iam8bit knows how to advertise itself: slyly, theatrically and with neat, removable swag. iam8bit does a bit of everything — they host art exhibitions and publish books, produce T-shirts and tchotchkes, and — for the right client — provide marketing and creative consultation. In the words of their online manifesto, they're in the business of "making awesome things." You should care: most of these "awesome things" contain either subtle or explosive nods to video games and gaming fandom, and iam8bit's corporate clients include Bethesda, Gearbox and Square-Enix. Over the next few months, iam8bit will be launching a new art show (in a new exhibition space) and publishing an art book. 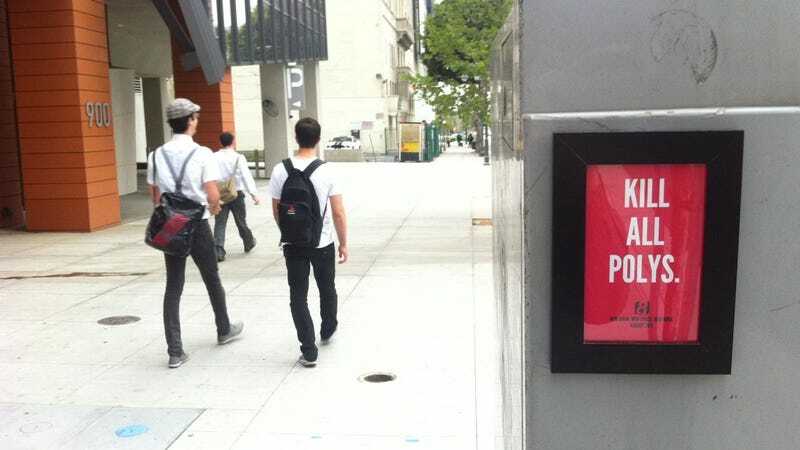 As a way of drumming up interest for these initiatives, the iam8bit gang engaged in a "stealth" advertisement campaign during E3. Those winding their way to downtown L.A.'s convention center two weeks ago might have run across the collective's handy-work: frames containing slogans, adhered to lamp posts, walkways, the sides of buildings, and even buses. In in the midst of bikini car-washes and building-length posters, iam8bit's guerrilla-approach could very well stand as E3 2011's most original attempt to elicit attention.